Steve is an award-winning filmmaker and musician who graduated from NYU’s Tisch School of the Arts with a BFA in Film and Television Production. 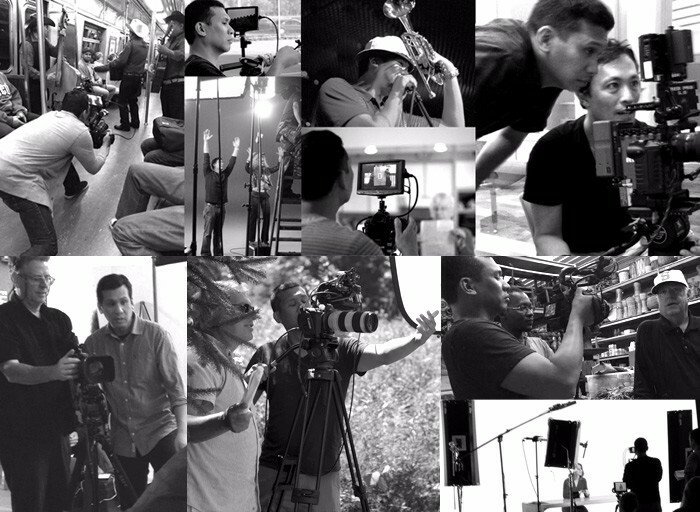 Whether he’s directing a full-size commercial shoot or a one-man guerilla setup, Steve produces memorable and engaging work that spans across commercial, corporate, music video, documentary, comedic, and narrative film fronts. He is a jack-of-all-trades, editing his own work, as well as shooting most of it. Steve got into the director’s chair via the editing room, as an editor at the acclaimed New York production company, Woo Art International, where he edited music videos and corporate films for such directors as Charles S. Stone III, Marcos Siega, Arthur Jafa, and Roger Woo. He quickly moved into directing and became the house director and editor at Woo Art. Steve eventually moved on from Woo Art to produce work through his own company, Slow Jam King Productions, and has extensive directing and editing credits for a long list of clients including HP, SAP, Bayer, Pfizer, Johnson & Johnson, Actavis, The College Board, and Sony. Steve’s debut feature film, the road trip comedy Slow Jam King, won Asian Cinevision’s Emerging Director Award, and was picked up for distribution by Unitel Pictures International (Blossoming of Maximo Oliveros, Imelda), garnering critical acclaim across its theatrical release and film festival run. The New York Times hailed Slow Jam King as “Do it yourself filmmaking at its purest… with spirited characters and high levels of comic energy.” It was available on Time Warner and Comcast On-Demand, as well as Netflix and Amazon Instant Video. Steve’s second feature film screenplay, Alternate Side, was a finalist for the 2008 IFP Emerging Narrative Screenplay. His music video for P.I.C’s “Got Me Like” won the Michelob Light Music Video Award at the 2005 Asian American International Film Festival and was voted by CNET’s Download.com as one of the Top 10 Videos of the year. Steve directed and edited segments for the AZN Television series, Cinema AZN , which won a NAMIC Vision award for best variety & music show. Steve also served as the Director of Photography and Lead Editor of the acclaimed lacrosse documentary, The Lost Trophy, which was picked up by ESPN and had multiple airdates on ESPNU and is available on Vimeo’s On-Demand video service for rent or purchase. As an accomplished musician and composer, Steve can be heard on Comedy Central, Showtime, The Oxygen Network, VH-1 and AZN Television. He wrote the theme song for the Oxygen program, The Pink Palace, as well as Premium Blend, on Comedy Central. He is an active studio musician, lending his piano, trumpet and vocal skills to film and television projects. Steve has co-produced four albums with his band, P.I.C, as well as numerous compilations and soundtracks. Steve wrote and performed much of the featured pop music in Slow Jam King , a soundtrack hailed by the Village Voice as “Enthusiastically scored to the titular quiet storms, ersatz c&w, and hip-hop textures.” He is currently working on a new musical project, Sulu and Excelsior.